Two of my favorite about Florida things in one shot. This little guy was in my back yard. Geckos and small lizards fascinate me. They're completely harmless and sometimes are quite friendly in their own fearful way. The worst thing that ever happened to me was I had a gecko mistake my leg for a tree trunk and it climbed into my shorts. Luckily my back yard is secluded because in order to get the confused beast out of my pants, I had to take them off. Getting the lizard out of the shorts it then proceeded to climb to my elbow and then jumped to the grass and ran off to its destiny. I think this one realized that the guy with the camera phone meant it no harm and stayed in the sun in the middle of the afternoon while I was able to take this shot. The gecko is only about the size of your small finger, and is on a leaf on a tree in my back yard that I'm nurturing. From a casual look over Wikipedia it looks like a Common House Gecko, they're found world wide and I'm quite surprised to find that they can be found indoors in Philadelphia. I guess they eat roaches in those homes in the city. A nice way to keep the pests down if you ask me! The tree is a Mango tree that I drove all the way down to the edge of civilization, Kendall, to get. This tree is in a pot near my pool and is all of three feet tall itself. I've got a Condo Mango of the Cogshall variety. I have been told that if I take proper care of the tree it may get all of ten feet tall and bear fruit in a couple years. I could plant it in the ground if I had room, but I really don't since that pool takes up the majority of my back yard. I could plant it in the front yard if I didn't want to get any fruit since people do like Mangoes. That would be why I have the tree since I am one of them. To say I like Mangoes would be putting it mildly, I may indeed be borderline obsessed. It is probably my favorite fruit. Some of the postings last year would bear that out. My neighbors know of it and have been kind enough to give me fruit from their trees, and I am very thankful for that. I'm looking forward to getting shopping bags full of them from trees throughout the city and having months of smoothies and puree. 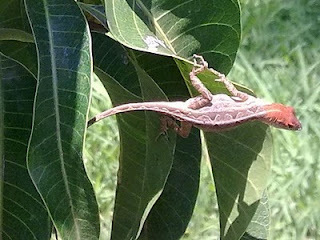 Until then I'll watch my little tree grow and see these little lizards climb the thing looking for insects to eat.